​WISH THIS STORY had been around 33 years ago! Maybe it would’ve helped me make a different decision when facing a crisis of my own. This tale of redemption sparks hope and makes you realize that an unplanned pregnancy isn’t “the end” of a woman’s story, just a comma in her journey. Not only that, but there is destiny woven into each and every life with consequences far beyond any one person. For such a heavy subject matter, Tidwell maintains a light touch and quick pace. Great read for the beach! The author left me so intrigued with the characters, and the circumstances connecting them, that I finished wanting to know more. Hard to give a detailed review without spoilers, so I'll close by saying that I am glad to have discovered Ms. Tidwell’s work and I do hope to hear more from her in the future. ​WONDERFUL STORY! This was a great way to start the summer. PEGGY TIDWELL is a brilliant novelist. 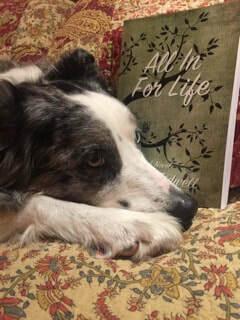 All in For Life is a hard book to put down. Every new character creates more anticipation. Tidwell's ability to weave together many lives to redeem a life-time of regret is marvelous! Great read for the summer. JUST FINISHED this new novel by Wimberley writer Peggy Tidwell. I could not put it down. It was really wonderful! THE BOOK was my beach read as well! Read it every spare moment I got. It was so engaging, hopeful and full of grace and redemption. It had the telltale attribute of a good story - it lingered even after I finished it. It was joy to read.